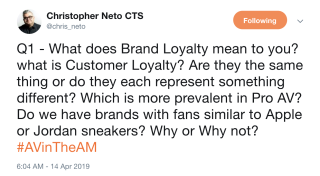 In the latest session of #AVintheAM—a popular Sunday morning Twitter chat—Chris Neto, #AVintheAM originator and social media expert, asked questions like "What does brand loyalty mean to you?" There is definitely no Apple or Jordans in AV. In fact I've seen the opposite. Clients think they hate "brand X," but it's only because their previous integrator did a bad install or didn't train properly. Loyalty is driven by product reliability, support, resolution of issues. As someone who walks the tightrope between end user and integrator, those are the loyalty-earning qualities. Brand loyalty to me is the brand that is a partner and stakeholder in the project sharing some of the risk. Margins always have to be taken into account, but knowing they have got your back for issues and upgrades is priceless. I’m brand loyal and it lends to being customer loyal. So if my customer trusts product A (all things not being equal like price and capabilities and service) it’s likely that they will try brand B in a smaller project first to see success before sharing the love. Brand recognition/loyalty is huge in our industry. As a new integrator, having access to certain manufacturers is almost a barrier to entry... and not because there aren't alternatives. Do brands have fans similar to Jordan sneakers? Have you seen the Zoom Twitter feed? The amount of raving fan tweets they retweet on a weekly basis is unreal, and it's been like that for years. Lots of brands in AV have loyalty, not sure how many have fans like Zoom. I think we #AVTweeps tend to get more tech fanatic/loyal than brand. I’m a massive OLED fan girl so at the moment I’m an LG fan girl since they are leading OLED at the moment. But if say "OLED, Inc." or some other company took the lead, I’d fangirl them.